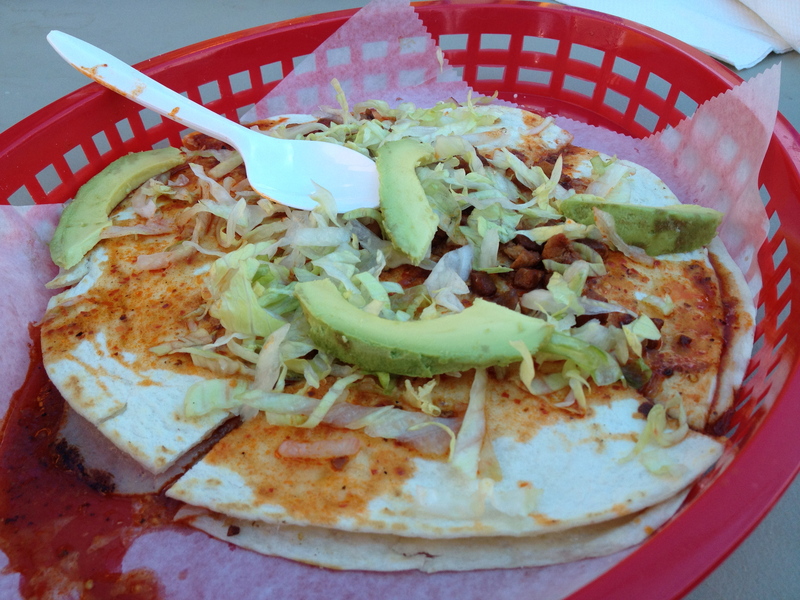 Sinchronizada – is like a quesadilla but it is made with two flour tortillas instead of one folded one and it usually contains ham. 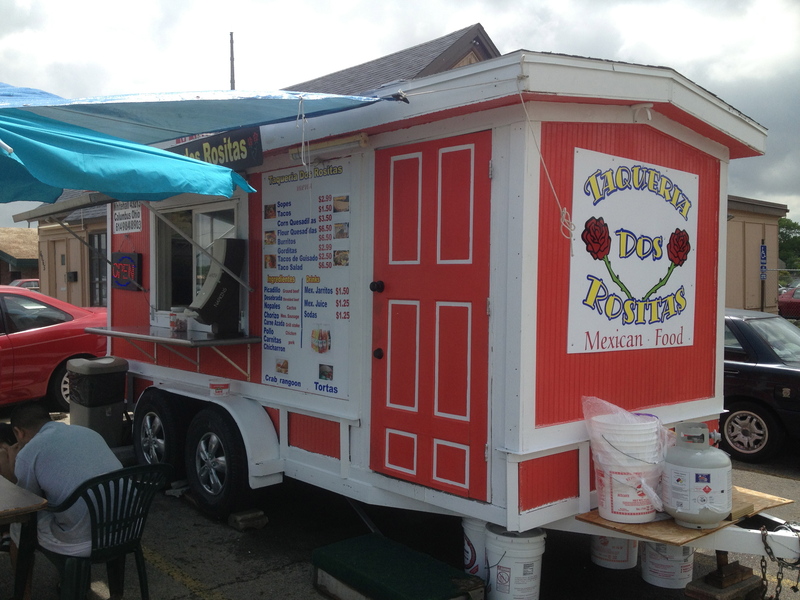 El Taco Peton is the newest truck on the NE side of town. Parked in the lot of La Cabana lounge it’s open late at the weekends. 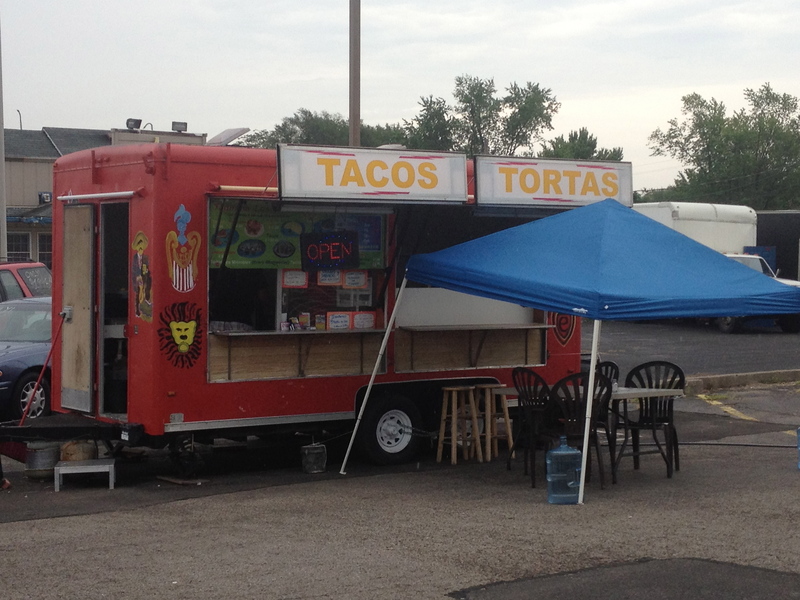 This truck is the former Pupuseria Salvadorena and is maintaining the same location, so it is appropriate that they still serve pupusas as well as some standard taco truck fare. 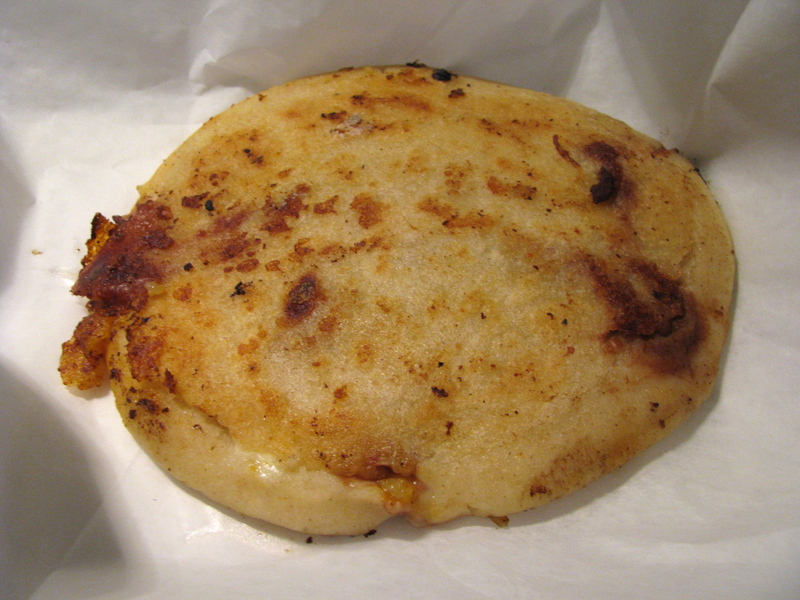 These were the thickest pupusas we’ve ever had but they were well cooked and had a nice crunch to them. 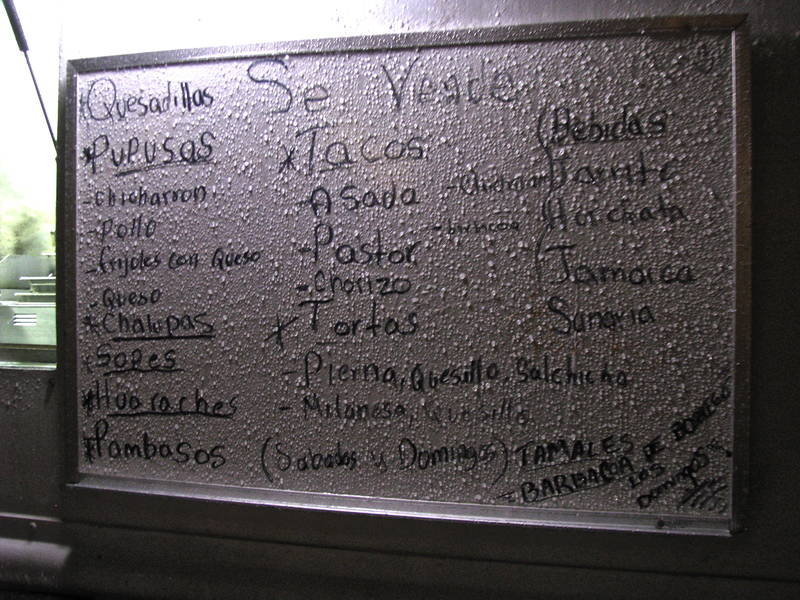 We visited El Taco Peton on a cold wet rainy evening – so apologies for the menu photo. 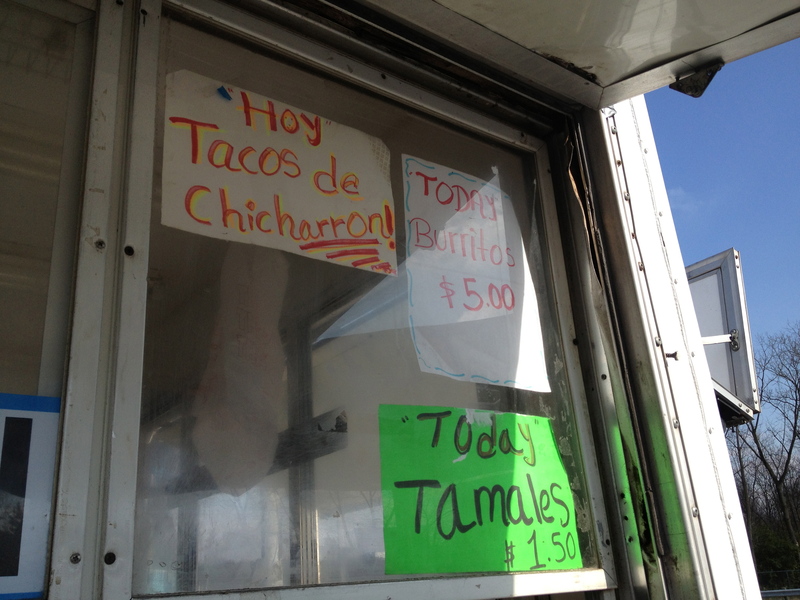 The most interesting thing on the menu was the chalupas, something we haven’t seen on any other taco truck menus in Columbus (yes, we know – Taco Bell has something with the same name). The version of chalupa here was different than what we expected – a taco with mashed potato and onion and topped with lettuce and shredded chicken. I liked it but I’m a sucker for mashed potato. The chalupa is pictured below with a couple of tacos (al pastor and asada). One of the other more unusual dishes was the pambaso (pambazo) – a torta where the bread is dipped in a red guajillo pepper sauce and the filling is potato and chorizo. 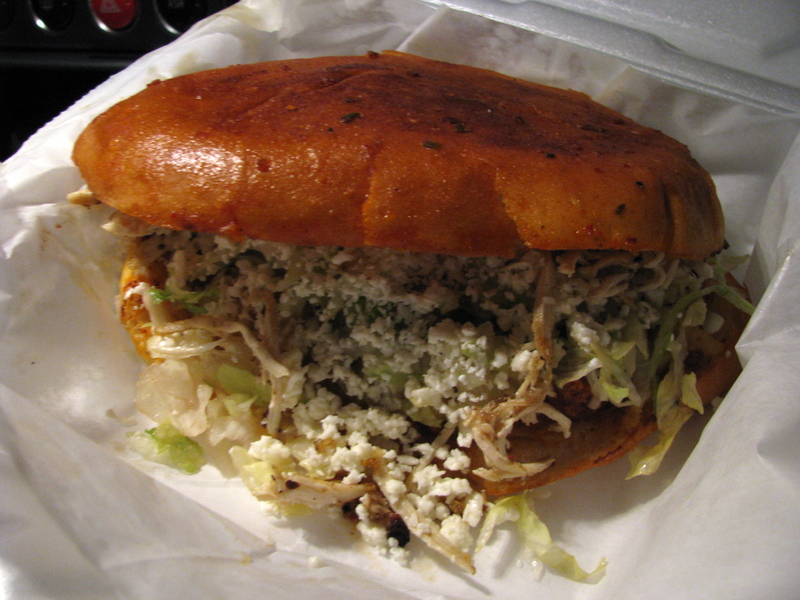 We didn’t think that it was quite as good as Don Pedro’s – our favorite pambazo in town – but it’s still a satisfying sandwich. 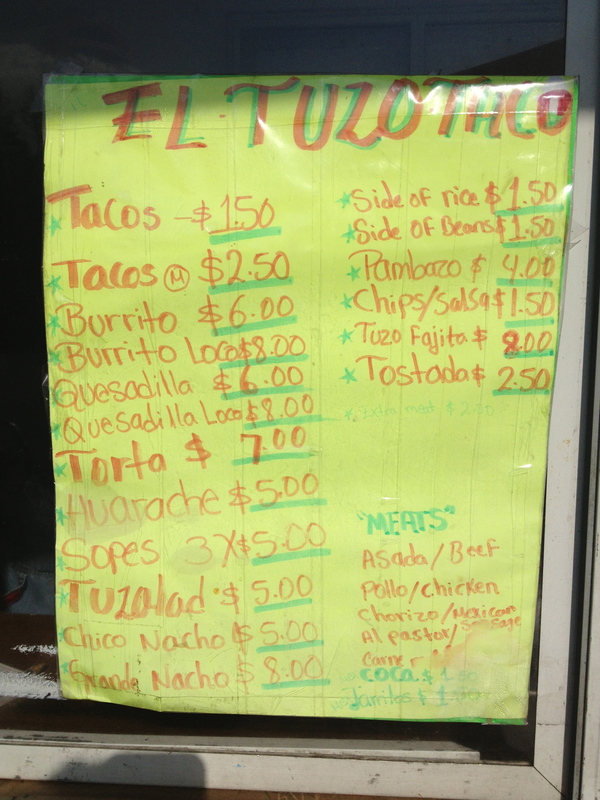 Although there’s a limited selection of meat options (steak, chicken chorizo and al pastor), the menu selection at El Tuzo is otherwise quite broad. We were happy to see pambazos pop up again, but when we visited they did not have the ingredients for them. 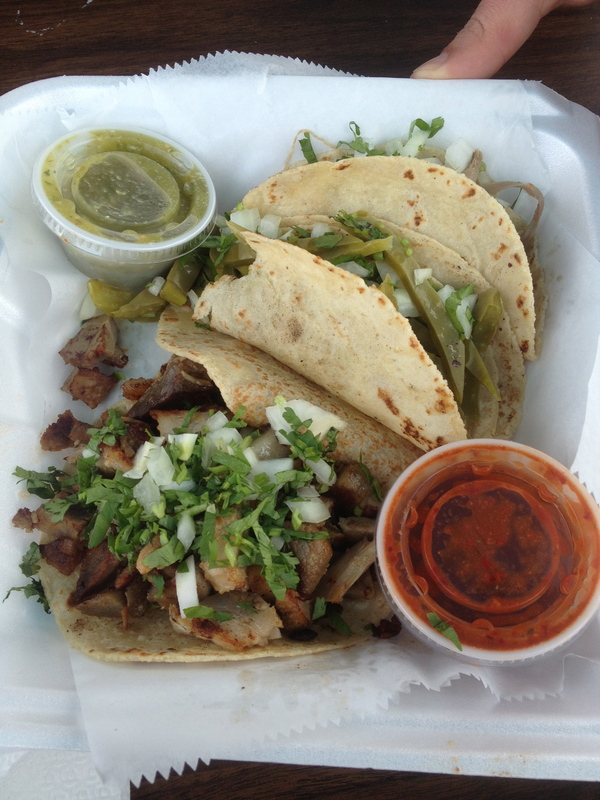 In addition to the regular menu items, they also have some weekend-only specials: tamales, tacos de chicharron and menudo. 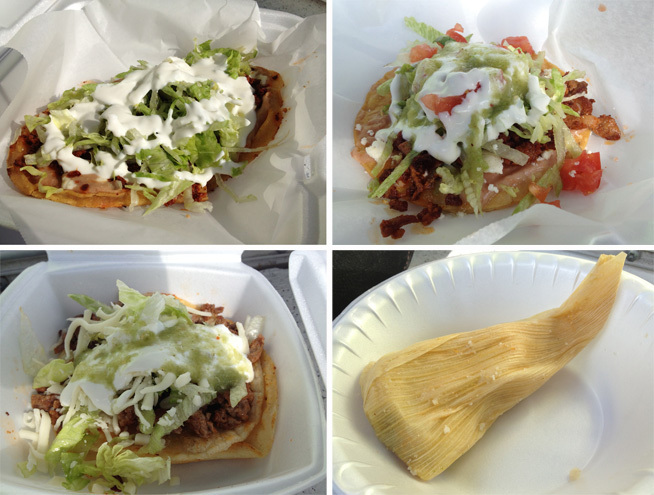 We tried a taco, a tostada, a hurache and a tamale and, between them, sampled all of the different protein options. Everything was perfectly passable, little struck us as exceptional. 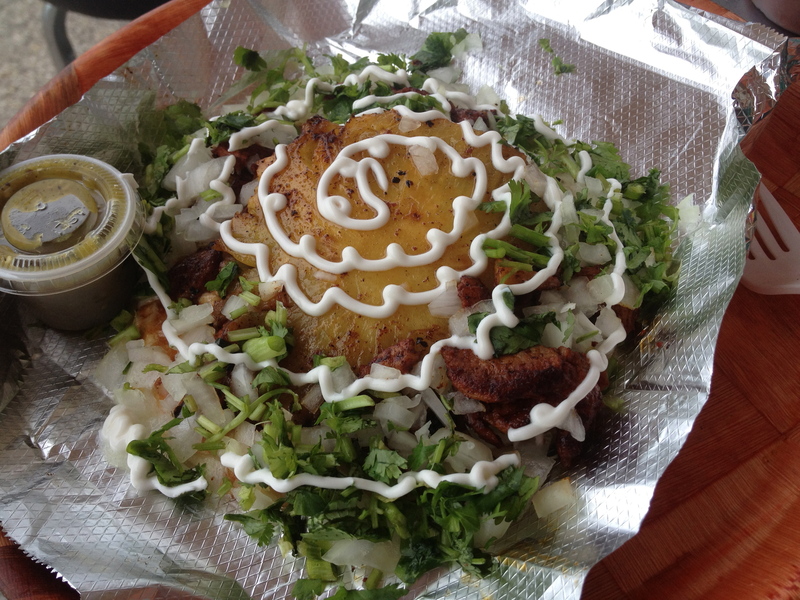 The tostada shell was made to order, a hand fried tortilla rather than a store bought one – a nice touch. The hurache was on the small side but serviceable. 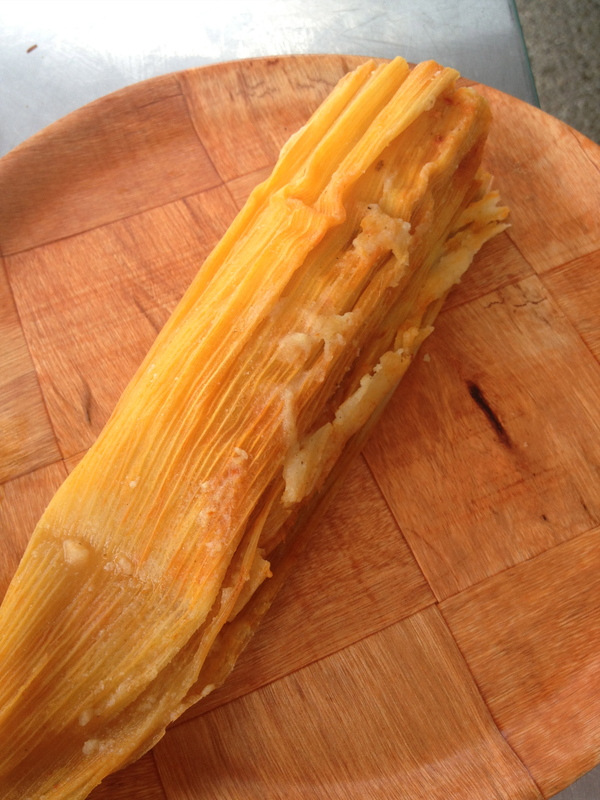 The tamale was made with green sauce and was nice and moist. 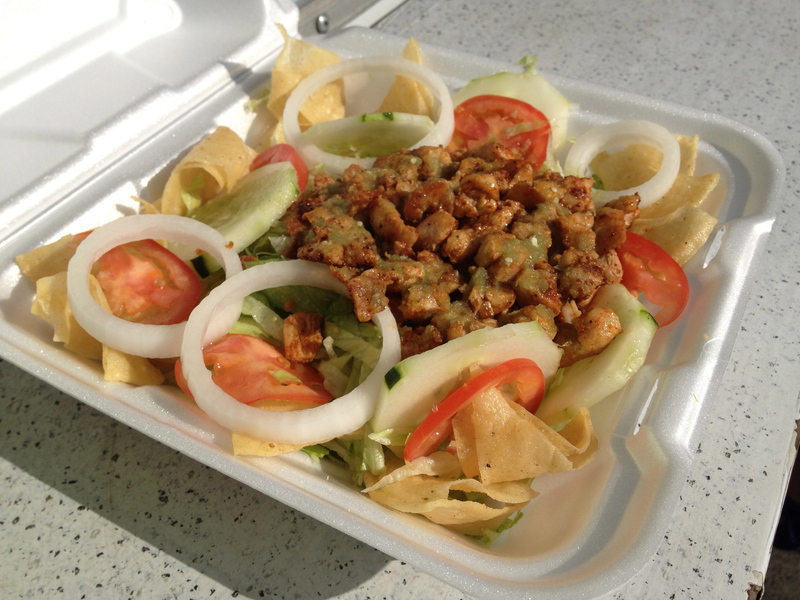 One more unusual dish is the ‘tuzalad’ which was a salad with your choice of meat plus lettuce, tomato, onion, cucumber and freshly fried tortilla chips. 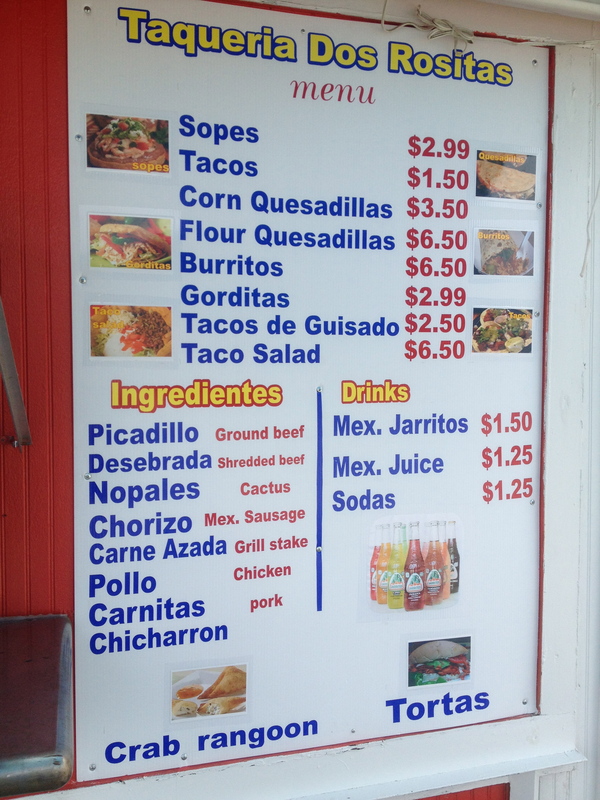 It’s not often that you see salads on taco truck menus. The meat shown in the photo was chicken, which had been marinated. We asked for the salsa (pictured) with ours as there did not seem to be any dressing. 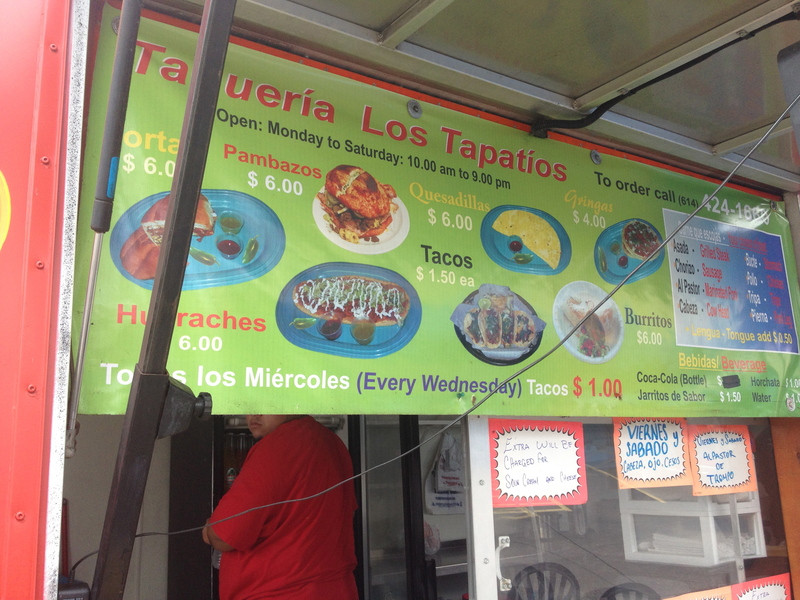 Los Tapatios is a reincarnation of the old East side truck Las Brasas. 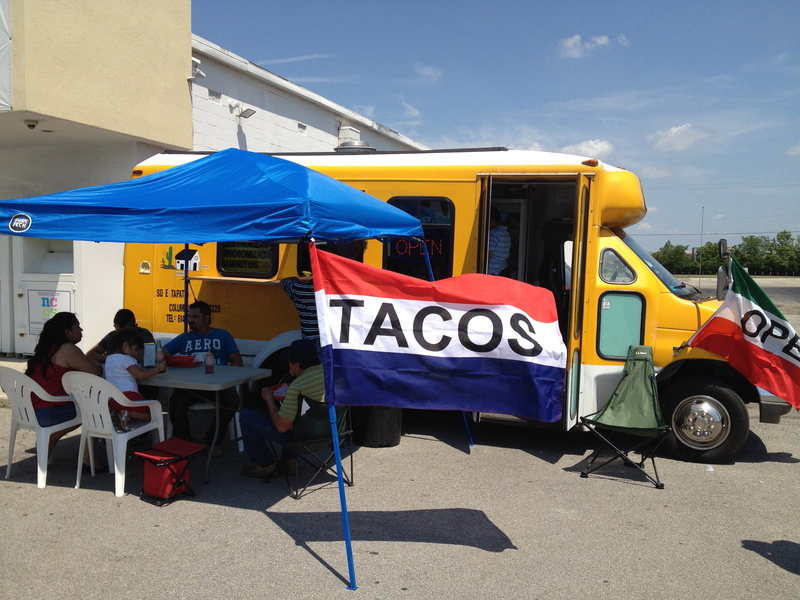 The new owners bought it at the beginning of 2012, and have reintroduced it with an interesting menu that includes regional specialties (pambazo) as well as some protein offering – eyeballs and brains – that we haven’t seen advertized at any of the Columbus trucks before. 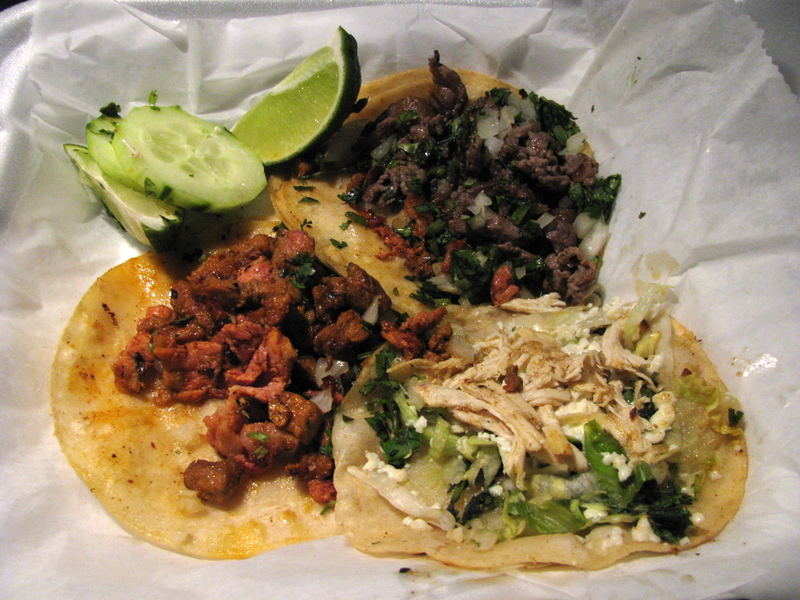 They also, of course, carry the standard offerings (tacos, burritos, quesadillas) as well as huraches and gringas. 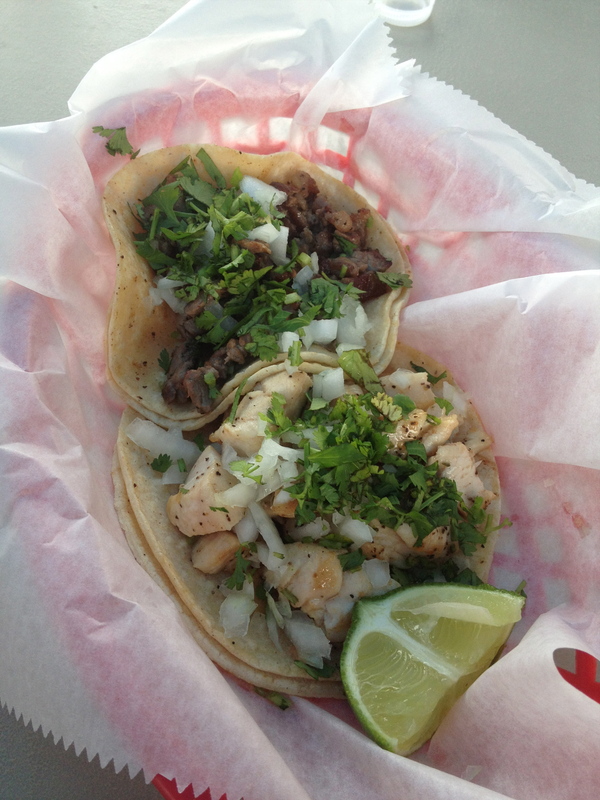 On Wednesdays tacos are $1. We weren’t able to try the pambazo as they were out of potatoes, or the eyeballs & brains (since it was a Tuesday…) so we went with tacos. We tried chicken, steak and tripa. All were were thoroughly solid, with a generous amount of meat. 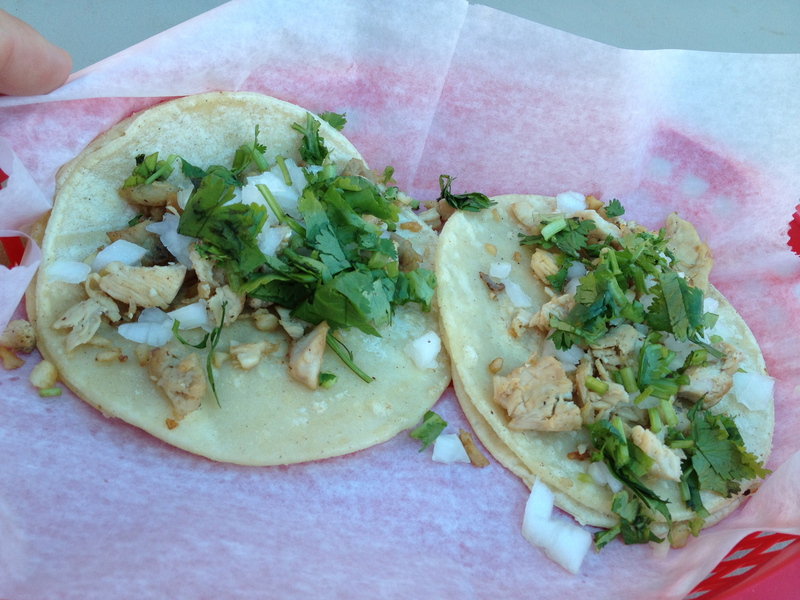 The chicken taco had meaty chunks of chicken seasoned with black pepper. 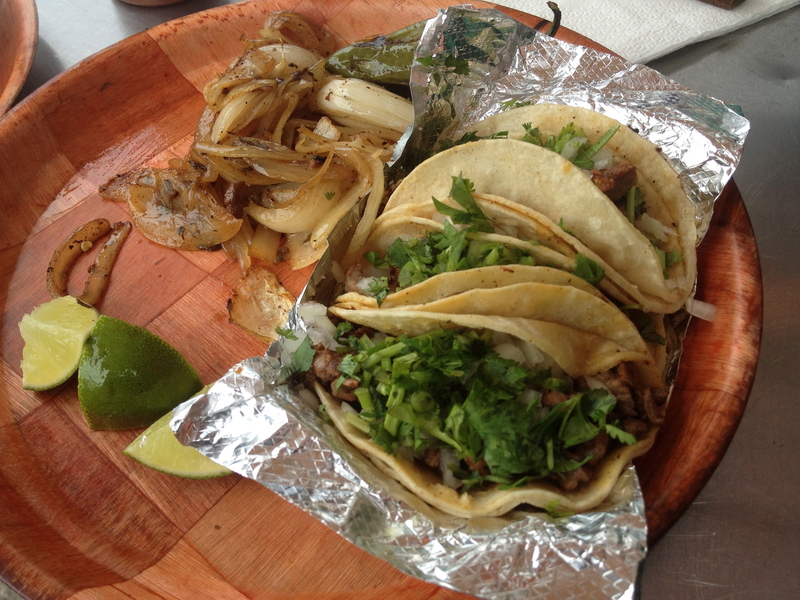 The tripa was probably our favorite of the three. On the first free Friday/Saturday we come upon, we’ll return to Tapatios to try the Andrew Zimmern stuff. Wish us luck! 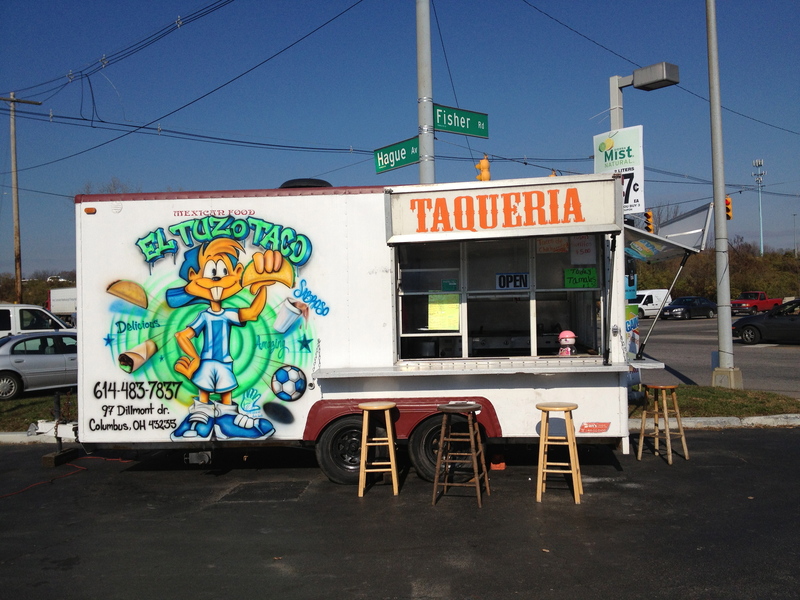 ‘Tapatio’ is a nickname for people from Guadalajara, and unsurprisingly so are the owners of this new truck. They have only been open a couple of weeks, and on our visit they had a limited menu; the only protein offerings were pork (al pastor), chicken, and beef (asada). 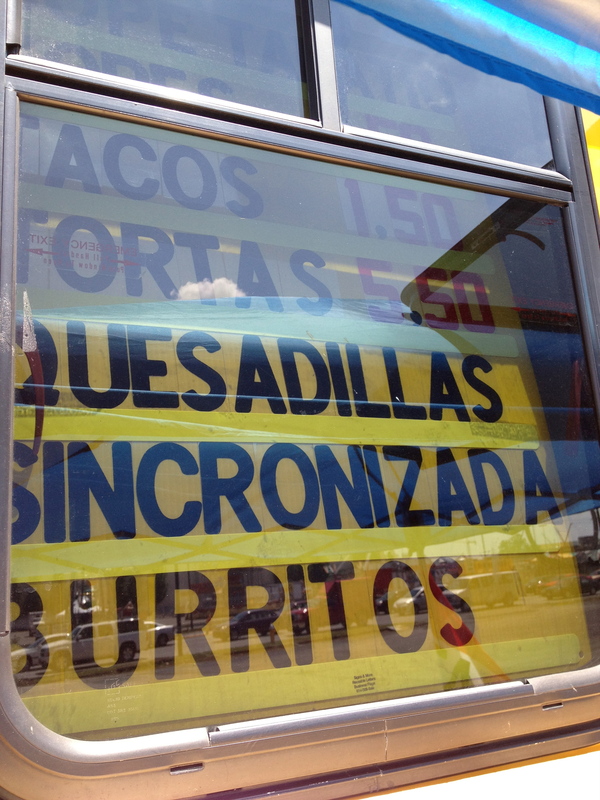 A sincronizada is a cross between a ham and cheese sandwich and a quesadilla. It is two tortillas sandwiching melted cheese and ham. Here it was topped with salsa, lettuce and avocado and cut into quarters. It was a little messy to eat and to my taste under crisped. 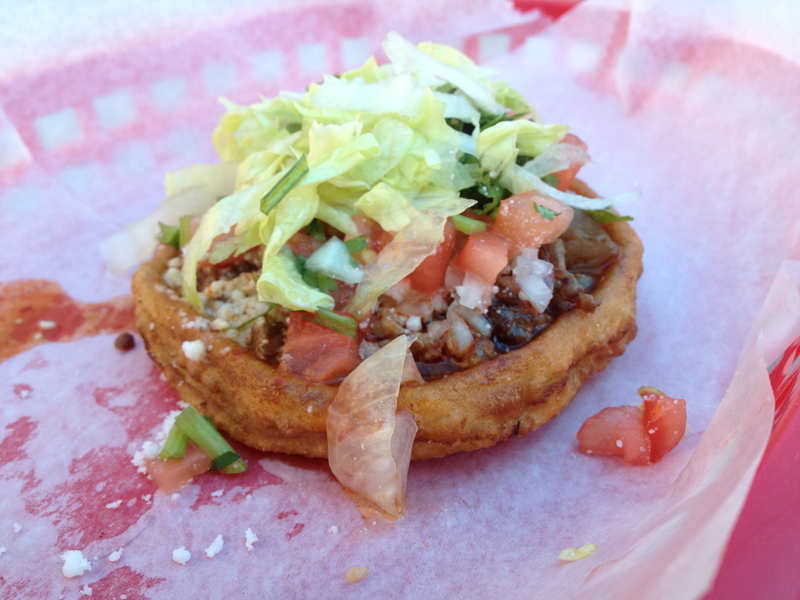 The sope was fried to order. It was smaller than some of the other trucks but the deep frying gave it a nice crunch and it wasn’t too greasy. We also tried some chicken tacos. Fine, but nothing special, and the tortillas were a little under done. Bear in mind, though, that the truck was pretty new when we visited – they deserve the benefit of the doubt at this point. They said that they plan to offer more meat options at the weekend including barbacoa and carnitas. 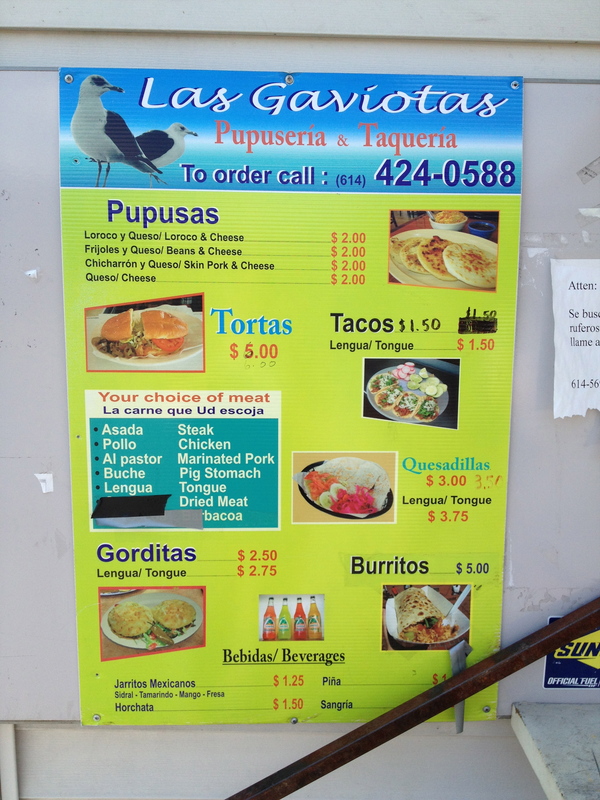 Las Gaviotas (which means ‘the seagulls’) is a Honduran-owned truck serving pupusas alongside standard taco truck fare. 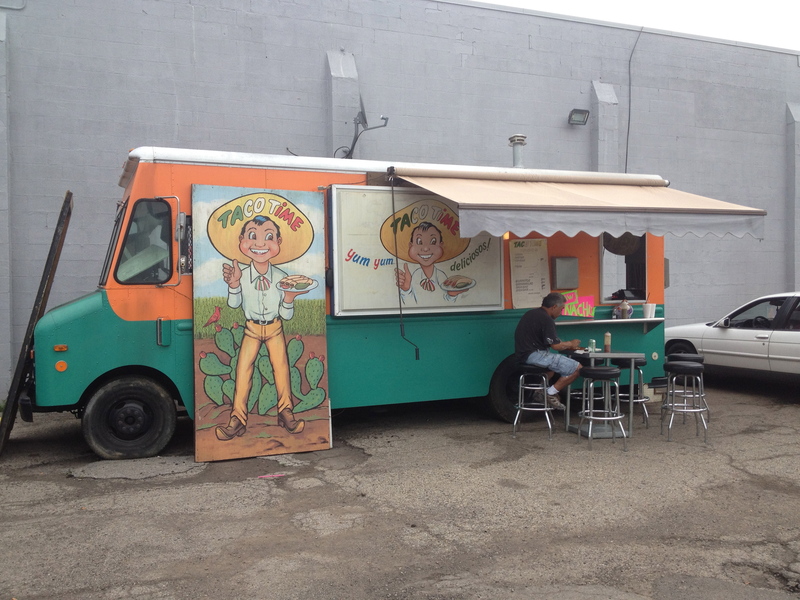 We thought that the truck looked familiar and indeed it was – it’s the old Chapis taco truck in a new incarnation. 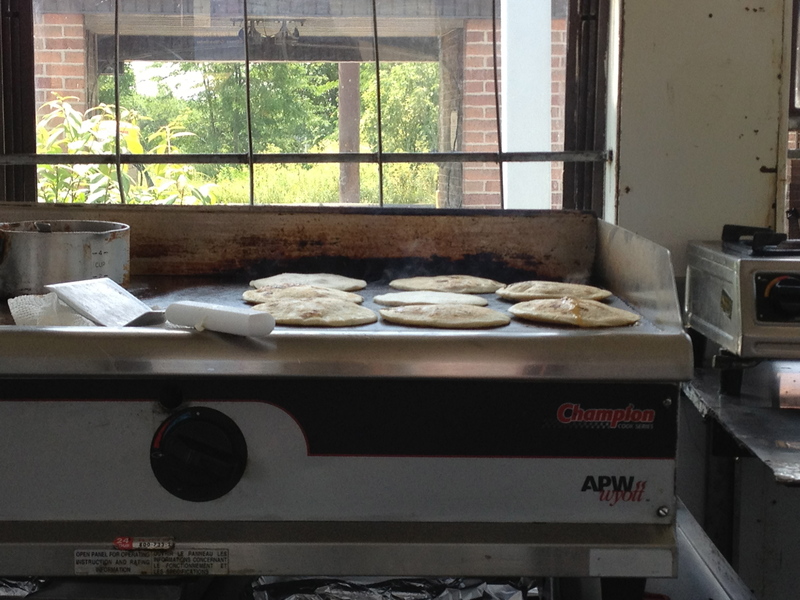 There is a choice of four flavors of pupusa and all were made from scratch upon ordering. 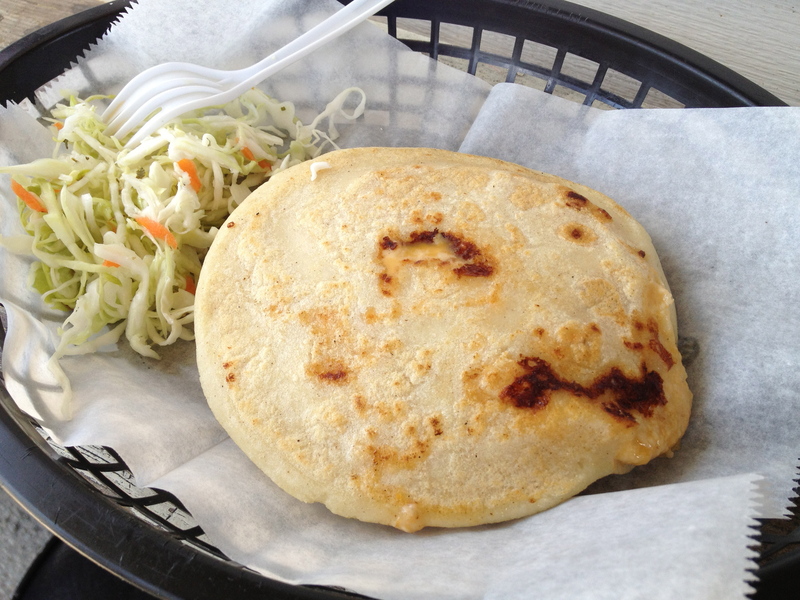 They were the plumpest pupusas we’ve come across in Columbus and were dubbed the ‘double-stuffs’ of the pupusa world. We tried the cheese and bean and the cheese and chicharron. The cheese and bean filled pupusa was universally popular. We couldn’t find much evidence of pork skin in the chicharron pupusa but that may have been a good outcome. We really liked the curtido (pickled slaw). It was milder in flavor than some renditions and was a refreshing accompaniment on a hot day. 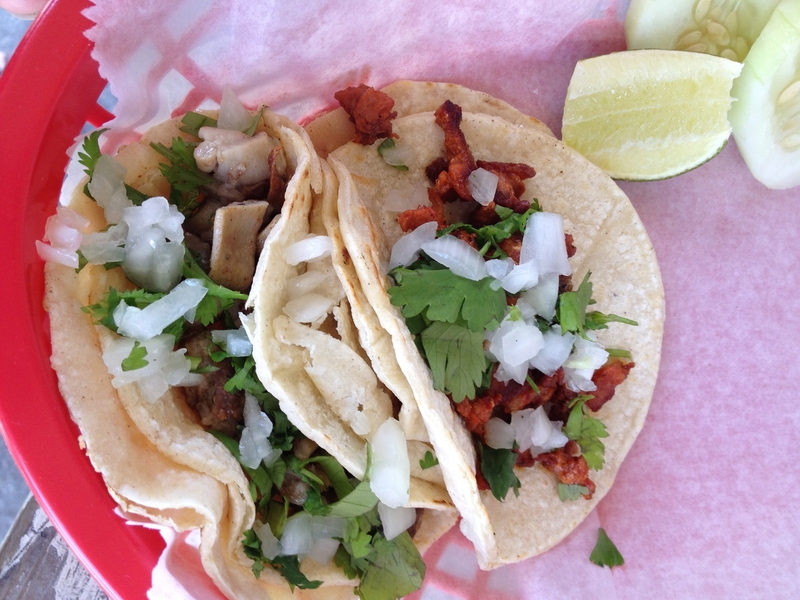 We tried the al pastor and buche tacos. The buche was very good, mild in flavor which suggests it has been carefully cleaned and prepared. The al pastor was pretty average. One notable thing is the tomatillo salsa looks fairly innocuous but is made with habanero peppers; delicious but not for the heat averse. Next up was a lengua gordita. The shell was prepared to order and was much less greasy than is often the case, but conversely the lengua was the greasiest we have had and the flavor suffered as a result.